I’m moving to London later this year and have been checking out what every reasonable ‘moving to a new location person’ checks out – places to stay, transport links, which bank to open an account in, gyms, parks/running tracks and of course a new mobile phone carrier. The decision to switch to iPhone land was a pre-requisite as a happily satisfied Mac’y. Apple tells me my options are O2, Orange, Vodafone or T-Mobile. I’m looking for reliability, consistency and of course a reasonable price. This narrows the choice to Orange and Vodafone. Orange is in the lead because (really) their website is appealing, it invites you in and keeps you there. Something to do with also, friendly, smiling French Orange rep I chatted to at LeWeb a few years back. Image really can be everything sometimes. Vodafone is a close second, brand recognition is working here. Hold on you say, what about O2? 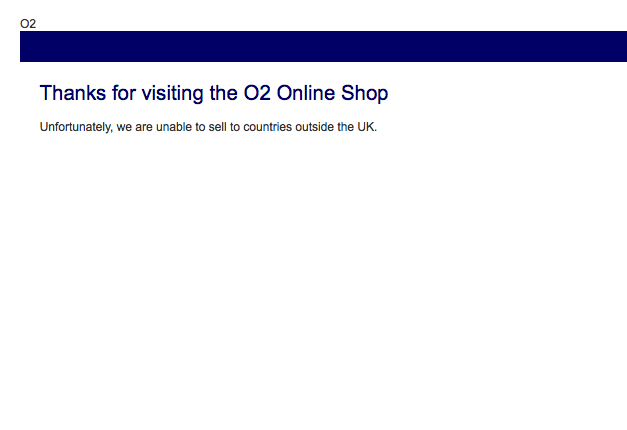 O2 was the first site I checked. After all, where was the Eddie Izzard show in London held last year? At the O2. So, brand recognition, check. Coverage, check. Ability to check out their website, prices, contract types from Turkey. Fail. Major fail. Can anyone explain the rationality here please?